Highly nutritious, and just as delicious! 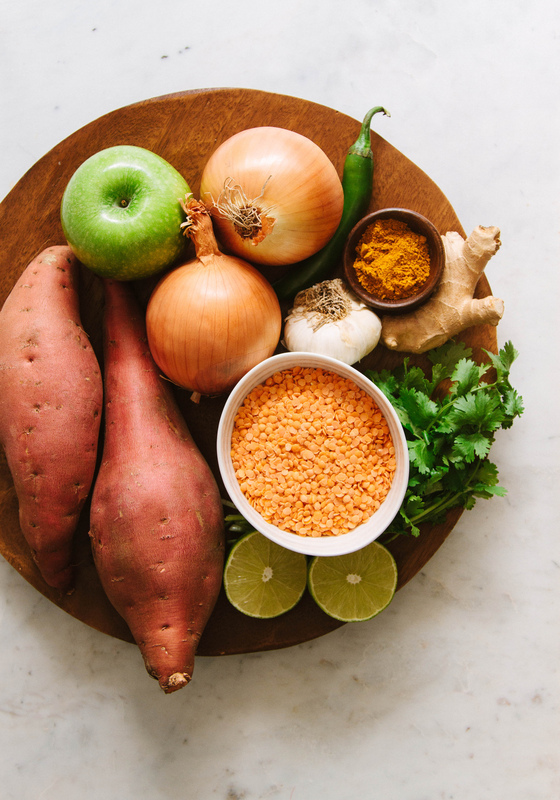 Nourishing sweet potatoes, and protein-rich red lentils, simmered together with a tart green apple, aromatic ginger, curry, cilantro, onion, garlic and coconut milk. 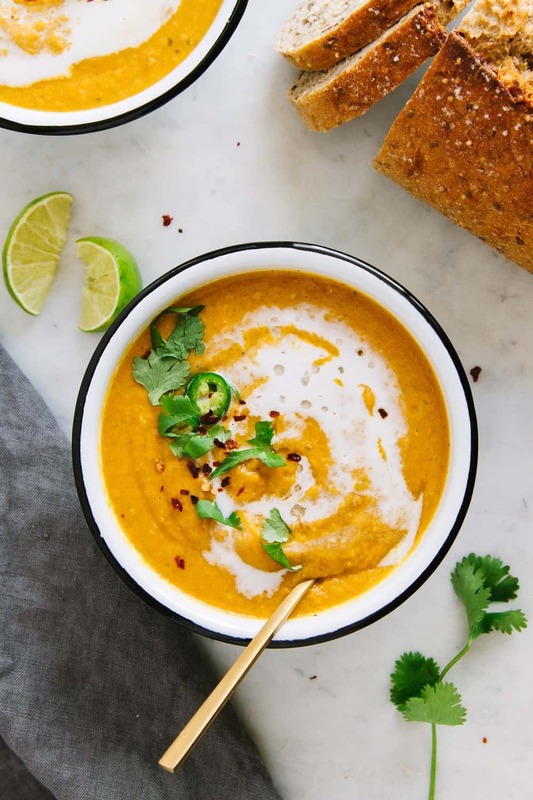 This glowing Curry Sweet Potato & Red Lentil Soup recipe is nutrient dense and full of great flavors! 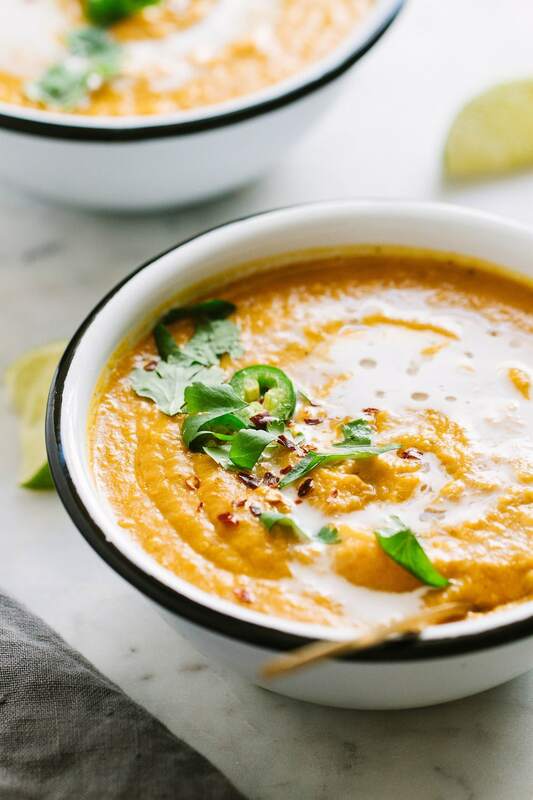 With soup season about to start, and the temperatures begin to fall, warm up the kitchen and wrap your hands around a bowl full of this thick, hearty soup. 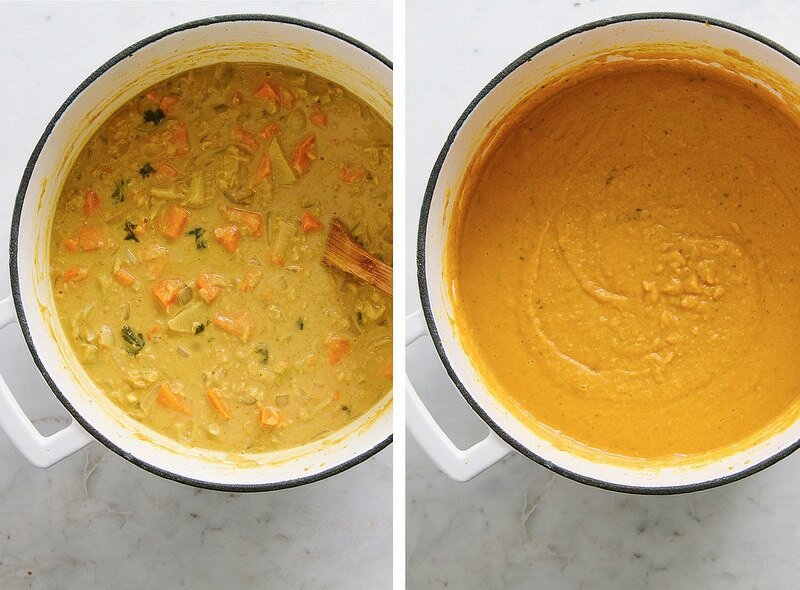 It’s a lovely combination of both savory & sweet, and just may be your new go-to soup! 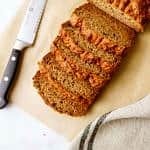 I ran across this recipe from BBC Good Food with (mostly) great reviews and couldn’t pass up adapting it to fit into the recipe collection. The ingredient list is fairly simple and straight forward. 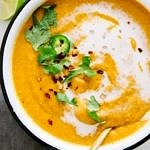 What I really love about this recipe is the addition if a green apple and toasting the curry. I didn’t change the original recipe too much, just a few tweaks to make it vegan and make sure it isn’t overly sweet. Narrowing down the apple choice. The original recipe calls for an ‘eating’ apple, but after reading reviews that the soup was too sweet, I decided to narrow it down and go with a green apple. The tartness helps cut into the sweetness of the potatoes. Also, some didn’t like the lime juice, but I loved it here. It will also help cut the sweetness, as well as add a little brightness. I would suggest starting with 1/2 of the lime juice, and adding the other half if needed. I didn’t find the soup to be too sweet at all with the green apple and lime juice, just a nice balance of sweet and savory. 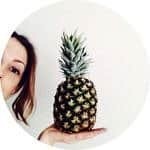 For the milk, feel free to change it up using either coconut milk (light, full-fat, or cream), or your favorite non-dairy unsweetened milk. I used coconut cream here, and needless to say it was delicious! 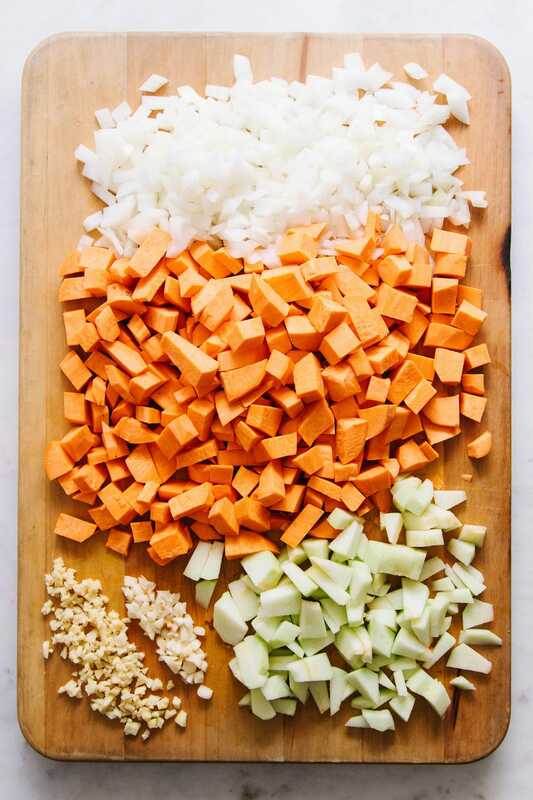 Cube, dice and mince your ingredients, and cook in a large dutch oven or pot – you’ll want to use at least a 5 quart pot. The soup on the left has just finished simmering, and can be eaten as is if you like. At this point the soup is a mustard color, but once pureed the soup will take on an amber glow. If you prefer your soup in the middle of pureed and chunky, you can always roughly puree the soup, which is what I usually do. I love finding a few chunks of goodness here and there! 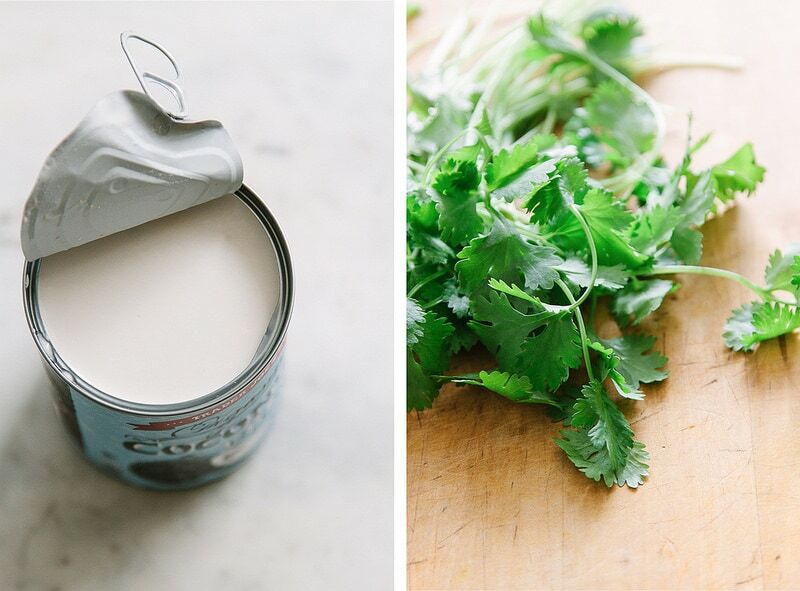 Serve with a spoonful of ultra-creamy coconut cream and freshly chopped cilantro over top. And for those who like a little heat, add a sprinkle of red pepper flakes and/or jalapeno slices to get your fix. 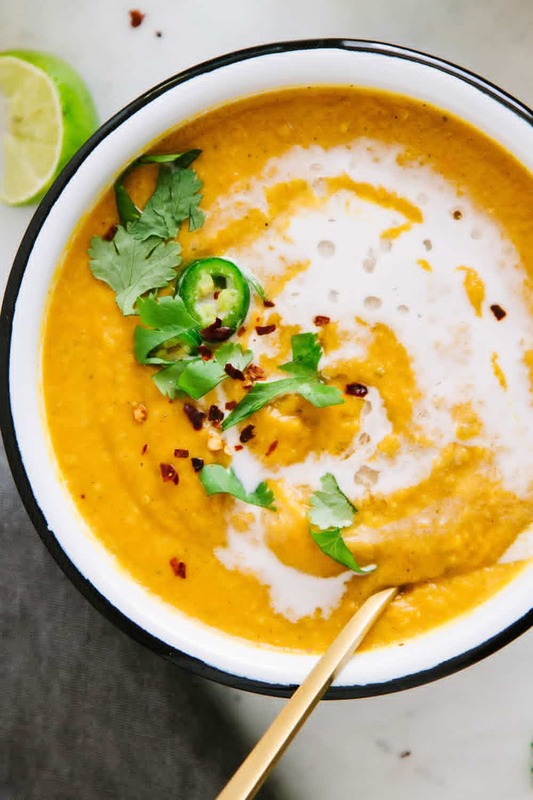 Both wholesome and nutrient dense, I hope you enjoy this soup as much as I did! 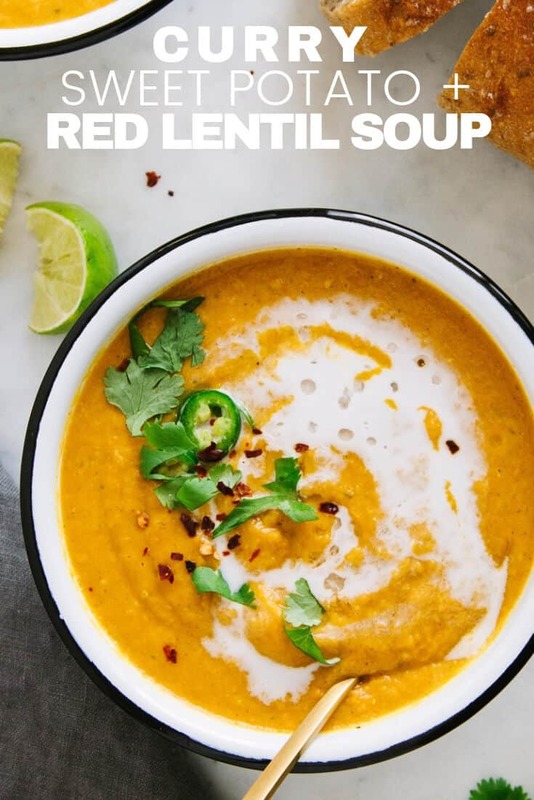 Red lentils add a good dose of protein and heartiness to soups. 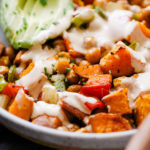 Try these other vegan recipes using red lentils. You may find a new favorite for the meal rotation! WOW! I cannot even put into words how good this soup was. I added a pinch of cayenne at the same time as the curry powder to let them “bloom” together and by the end, the soup was the perfect balance of salty, sweet, sour, and spicy. The extra squeeze of lime was a must, as was a good bit of cracked black pepper. Thank you – this recipe will serve us well in the future!! This is my new favorite soup! I love it! It’s so easy to make and I thought the flavor was perfect, not too sweet. I used 1 teaspoon medium heat curry and 1 teaspoon garam masala because I love garam. I double the lentils because I like to get more protein in my bowl. I also did half broth half water and it was perfect. For the people who think it’s too sweet..maybe you could use some regular potato and sweet potato mixed to cut the sweetness down a bit? Thank you so much for an amazing recipe!! I wondered how garam masala would taste with it! Next time, based on your comment, I will try it! Did you have to add extra liquid to account for the extra lentils? I made this dish with a granny smith and unsweetened coconut. I’m not a fan of sweet dishes. IMO, this is too sweet. I haven’t given much thought on how to alter this as the sweet potato, apples and onions are the source of sweetness. In general, it’s a good recipe. It’s just sweet. I added hot sauce and cilantro to cut it some and that helped. I made it last night and used fresh grapefruit instead of lime and it came out perfectly. I didn’t blend it either. Was delicious, and I am sure it would be amazing blended as well. Will definitely be keeping this on hand. This was delicious and very easy to make! I made it in my instant pot. I added all ingredients through the coconut milk and cooked in the IP for 20 min on the Bean program. 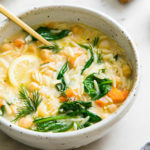 This soup is absolutely delicious! I didn’t have a lime on hand so I used a lemon, and it worked out great. I also used half broth and half water plus extra cilantro as suggested. So so good! This looks really good. 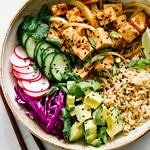 Do you think it would work out ok in the instant pot, and if so, for how long?? Great question! I have yet to use an instant pot (it’s definitely on my list of things to get), so I’m not sure exactly how it would do. It does cook really fast on the stove-top so if you decide to use an instant pot, I imagine it wouldn’t take very long at all. I’d love to know how it goes if you give it a try.